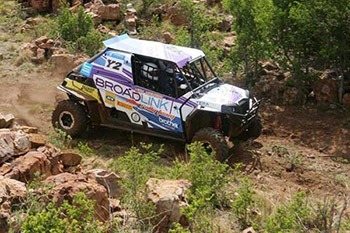 Darryl Curtis and Riaan van Niekerk, briefly traded their two wheel Dakar machines in for four wheels, when they were invited by Regent racing and Polaris to race the Donaldson Westonaria 400 cross country car race, the last round of the National championships and grabbed it with both hands. The side by side category is an experimental class that runs behind the National categories and has been formulated as a less expensive form of racing and a stepping stone and introduction into the mainstream off road cars. Two manufacturers have been approved, namely Polaris and Can Am, who have both appointed partners to get the cars to comply with the cross country regulations. They need to be fitted with special roll bars, 5 point safety harnesses, GPS, Trip meters, safety nets, intercoms, parker pump and a few other bits and pieces. Six of these machines were entered at Westonaria and there are around twenty cars on order between the manufacturers, which means that the class will be highly competitive in the second quarter of next season. 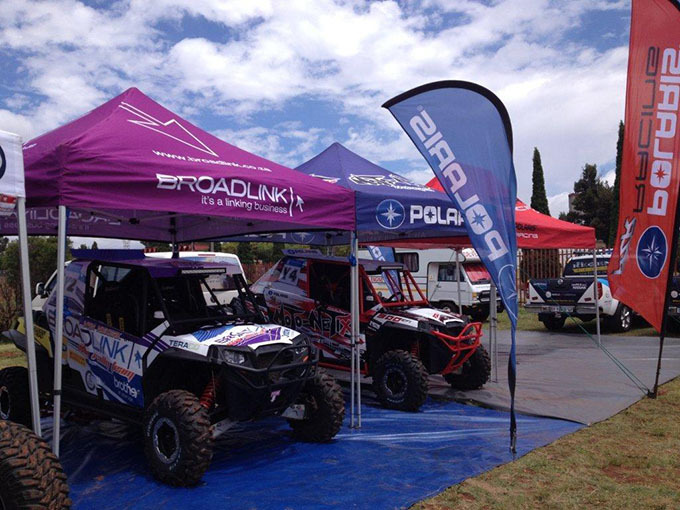 The class has already attracted the attention of national quad champ Leander Pienaar racing for Can Am and Brian Capper racing the Polaris for Regent racing. Don’t be fooled by their size or top speed of 115 Km/h, these little machines get there fast with their 4 wheel drive and eat rough terrain for breakfast. The 55 Km did not go exactly to plan when some over enthusiastic driving from Curtis over the rough terrain soon resulted in a flat front tyre and a few damaged arms, whilst the pair were trying to figure out just exactly what size boulder was clearable or not. During the tyre change when the cars engine was off, the latent heat build up in the engine department caused “heat soak” and resulted in the engine temperature reaching 130 degrees and going into limp mode. Some 20 odd minutes later, the pair were back on the road again, remarkably still in third as there were a few other cowboys out there as well. 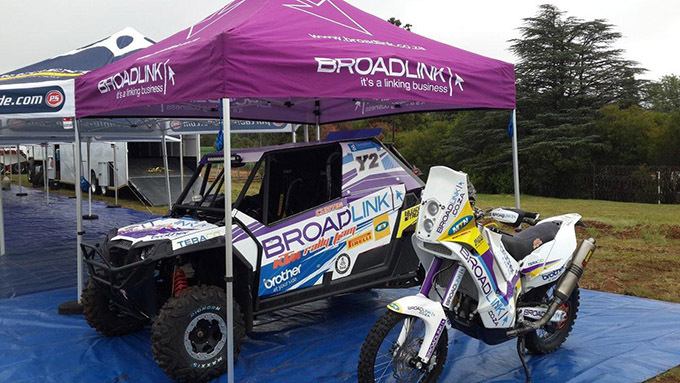 The main race, consisted of half the National fields race distance, 156 Km’s with Brian Capper, the prologue winner off first followed by Leander Pienaar in the Can Am who had suffered brake problems the day before. Curtis and Van Niekerk soon found their feet, passing Leander who still had brake issues, reeling Capper in setting the quickest time of the day. Congratulations to Brian Capper for taking the overall win ahead of Curtis and Van Niekerk. The first shipment of the popular Acerbis was distributed by AMP last month and is now available from there motor cycle dealers nationwide. The Acerbis product range is currently used by more top riders in almost every single motor cycle off road category worldwide. One only has to view their international star studded rider line up to put into context the preferred choice amongst professionals. 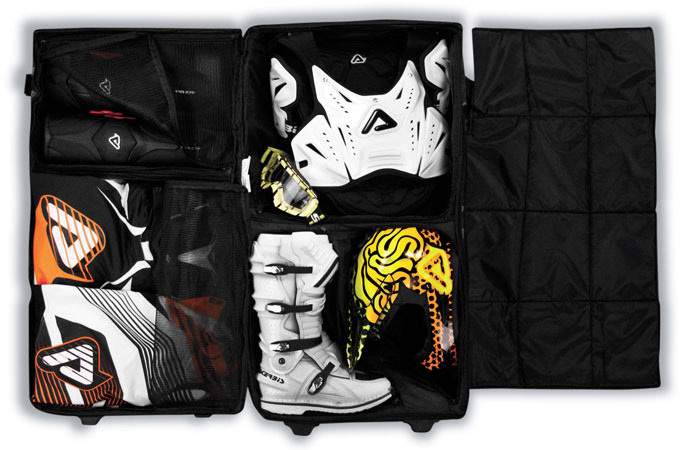 It is a highly respected brand and recognized as a leader amongst the riders worldwide. 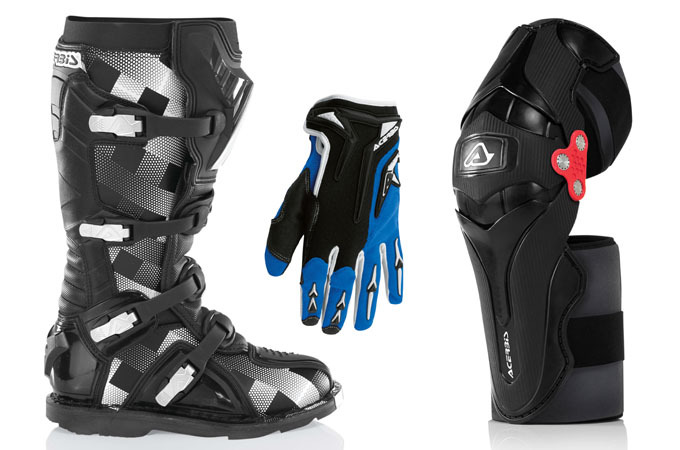 The new products are now available at selected dealers countrywide and the suggested retail prices for some of the new product are, the state of the art Back Comfort protector R865.00, the latest in MX-X2 gloves: R525.00, an awesome Predator travel bag for R2 300.00, Scotch boots for R3 150.00 and X-Strong knee guards for R1 995.00. Yes your favourite motorcycle TV quiz show is now back on air. It’ll be running up until Christmas with an exciting Grand Final before you have chance to open your presents. Pictured here is the aftermath of a recent episode with some of South Africa’s greatest leg-ends. All of them have achieved Springbok colours, except for Bill of course, but according to him he’s won a couple of drag races in Europe, so that’ll have to do. From left to right we have Keith Zeeman, Bill, Les Van Breda and Peter Labuschagne, who all look very pleased to have been part of it all. 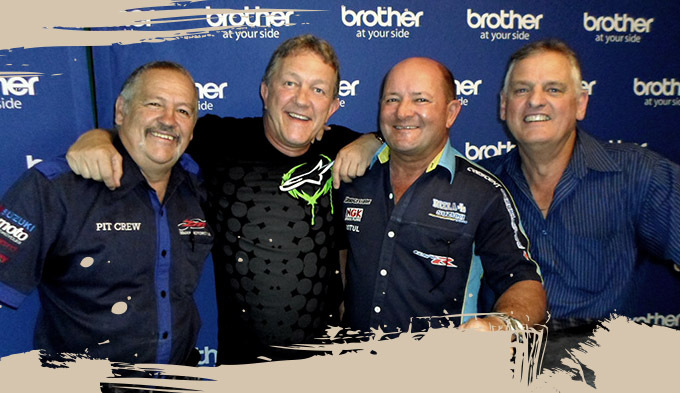 The 2Wheels quiz show will be aired on Supersport on Friday nights with many repeats throughout the following week. Go to www.supersport.co.za for time slots and more details. New BST dealer in SA.